Items contained in Breath of Life Haiti Clean Delivery Kits reflect the World Health Organization’s six principles of cleanliness for birth including, (1) clean hands, (2) clean delivery surface, (3) clean perineum, (4) clean cord cutting instrument, (5) clean cord ties, and (6) clean cord care of the newborn baby. 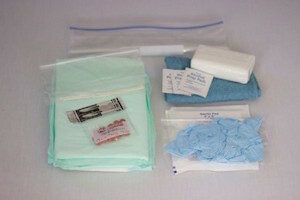 All of the disposable kits are pre-packaged for individual use, ensuring that each kit contains clean and essential items for a hygienic delivery. Each Clean Delivery Kit costs approximately $2 USD. Breath of Life Haiti is 501(c)3 organization with a mission to fight maternal and infant mortality in Dèsarmes, Haiti by offering a breath of life through providing prenatal and delivery care.